Snail Translator is the PUP that uses misleading techniques to prevent removal. Use Reimage to locate malicious components and get rid of them faster than with uninstall instructions. A full system scan blocks virus reappearance and prevents traffic to malicious domains. How can Snail Translator hijack your computer? Snail Translator is a deceptive potentially unwanted program (PUP), created by cyber criminals. It pretends to be a useful translation software while actually it is an adware program that sends multiple Windows Activation alerts claiming that “You must activate Windows within 1 day to continue using all Windows features.” After clicking the “Activate” button, the user receives another alert, which states that Windows Activation was unsuccessful and that in order to activate user needs to contact some suspicious support via this number: 1-877-330-4644. Do not call it, because these alerts are fake. If you see suspicious Windows Activation windows asking you to call support, it means you are dealing with fake tech support scammers. You should not call fake tech support because crooks will try to deceive you and steal money from you. They use various fraudulent techniques to gain access to victim’s computer. They usually claim that victim’s computer is infected so badly that it cannot be fixed without their help. They usually ask the victim to provide them remote access to it or ask to buy some fake security software. You should never give these cyber frauds any information that would allow them to hack your computer. Usually, they install ransomware or similar viruses that lock computer or encrypt personal files and then command the user to pay money in order to gain access to his/hers own computer or files. Crooks also often try to intimidate the victim by telling him/her that his/hers personal data will be published online. Therefore, if you have noticed these rogue Windows Activation windows, scan your computer with a reliable anti-spyware software and remove Snail Translator virus immediately. For that, we recommend using Reimage anti-spyware program. You should not mistake this program with Snail Translate adware, which sends various pop-up and banner ads when user browses the web. Stay away from any content marked as “ads by Snail Translator,” “powered by Snail Translate” and “Snail Translator ads” pop-ups and banners because they can force you to visit untrustworthy Internet sites. In fact, this program spreads using Trojan horse tactics; it tries to look like a useful translation software while it is actually designed to trick users into calling fake tech support number. However, Snail Translator PUP spreads just like any other potentially unwanted software. It has its official website, but it mainly travels alongside other free programs. PUPs are added to many free programs, so before you install programs, you have downloaded from the web, opt out all additional components added to them. You can do that through Advanced or Custom settings in the installation menu. In case you used to rely on Default or Standard settings, you probably ended up installing Snail Translator and possibly some other PUPs alongside your selected software. 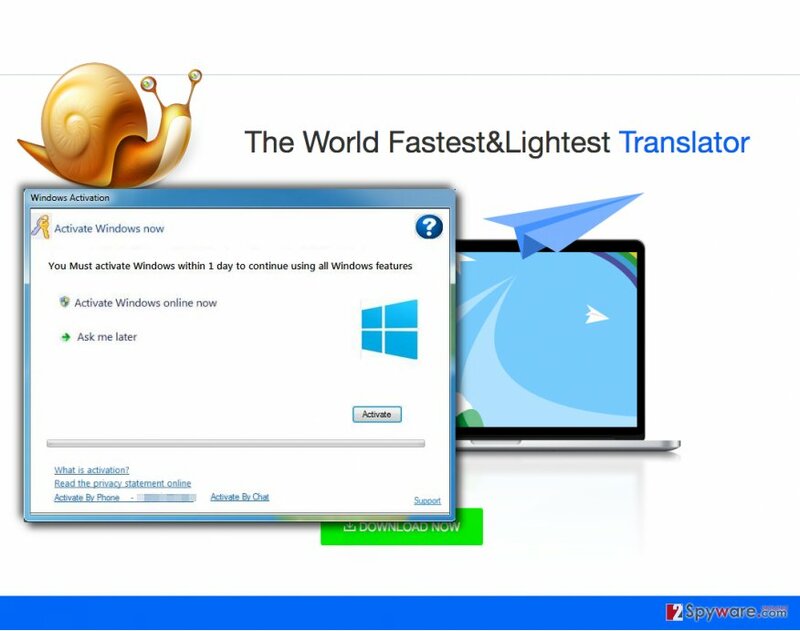 As we have stated earlier, you can remove all hazardous software from your computer automatically; however, if you are looking for manual Snail Translator removal instructions, navigate to page 2. It goes without saying that Snail Translator hijack is something that you should NOT tolerate. Now that Snail Translator virus has infiltrated your computer system, you have to find and remove its executive file and all files related to this deceptive software. We strongly recommend scanning your computer with anti-spyware program because it is a much easier way to detect all hazardous files in your PC. If you do not want to use an automatic spyware removal tool to remove Snail Translator adware, you can follow the manual adware removal instructions given below the article. However, if you do not want to experience similar issues in the future, consider protecting your computer with a proper security program. Here, look for Snail Translator or any other recently installed suspicious programs. Wait until you see Applications folder and look for Snail Translator or any other suspicious programs on it. Now right click on every of such entries and select Move to Trash. When in the new window, check Delete personal settings and select Reset again to complete Snail Translator removal. Once these steps are finished, Snail Translator should be removed from your Microsoft Edge browser. Here, select Snail Translator and other questionable plugins. Click Remove to delete these entries. Now you will see Reset Firefox to its default state message with Reset Firefox button. Click this button for several times and complete Snail Translator removal. Here, select Snail Translator and other malicious plugins and select trash icon to delete these entries. Click Reset to confirm this action and complete Snail Translator removal. Here, select Extensions and look for Snail Translator or other suspicious entries. Click on the Uninstall button to get rid each of them. Now you will see a detailed dialog window filled with reset options. All of those options are usually checked, but you can specify which of them you want to reset. Click the Reset button to complete Snail Translator removal process. This entry was posted on 2016-04-21 at 05:53 and is filed under Adware, Viruses. You can quickly scan the QR code with your mobile device and have Snail Translator manual removal instructions right in your pocket. How did you remove Snail Translator?